I love hearing stories about how people came to be lifelong friends and in this case, business partners. 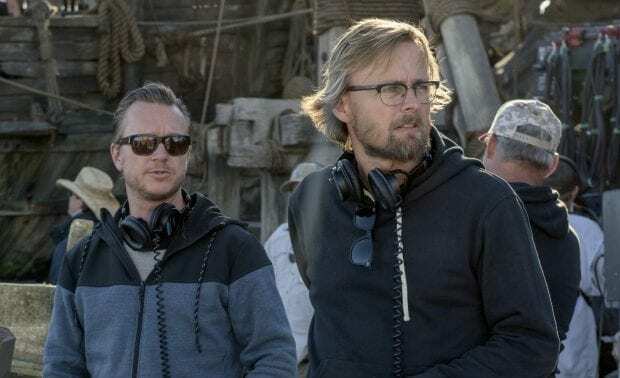 Joachim Rønning and Espen Sandberg have a great story to tell about how they became friends and started directing films together with the latest being Pirates of the Caribbean: Dead Men Tell No Tales. Q: So, because you work as a team and you work as a team so often, do you have individual roles in directing? Or because you’ve been working so long -–? Joachim Rønning: We only work every other day! [laughes, you swap out?] It’s very easy for everyone. No. [laughes] You know we don’t really know any other way of doing this then being together. For us, it’s a very natural process. And I think it’s a collaborative one. We include the actors and the crew and everyone as part of the discussion basically. And we try to create safe work environment as you could say.You know where every idea is welcome and we can, everybody can be a part of the discussion. And that’s important to us. I think that’s like probably one of the strong advantages that we have as a directing team. Q: How did this partnership begin? Obviously 10 years old, but were you friends from school? Espen Sandberg: Yeah. Really. We were –-Break dancers. [lots of laughter] Again, we were 10. And we immediately started making movies instead. And luckily we didn’t pursue the dancing career. We went for the moviemaking. Joachim Rønning: I think in that we were in elementary school, my dad bought a video camera so that’s why we kind of drifted into that and became very interested in film. Q: Do you have any of those early films? Joachim Rønning: Oh yeah, absolutely. It’s hilarious. [Using a high-pitched voice] And we were talking like this. You gotta love a story of friendship that includes break dancing and backyard filmmaking. I'd LOVE to see those films that they made as kids. L to R: Director Espen Sandberg and Director Joachim Rønning..©Disney Enterprises, Inc. All Rights Reserved. Q: Can you talk a little bit about how this film fell into your lap? Espen Sandberg: Yeah, it didn’t fall into our lap. We chased it. We really wanted to make this movie. And I think the basic reason as you know Joachim and I started making movies together when we were 10. Movies that inspired us back then was you know the Spielberg and Lucas and Zemeckis films. And this franchise just reminds us of that. And it has that unique blend of spectacle and humor and scary parts and also a lot of heart. So that meant a lot to us. The pair has been working on this film for over 4 years. 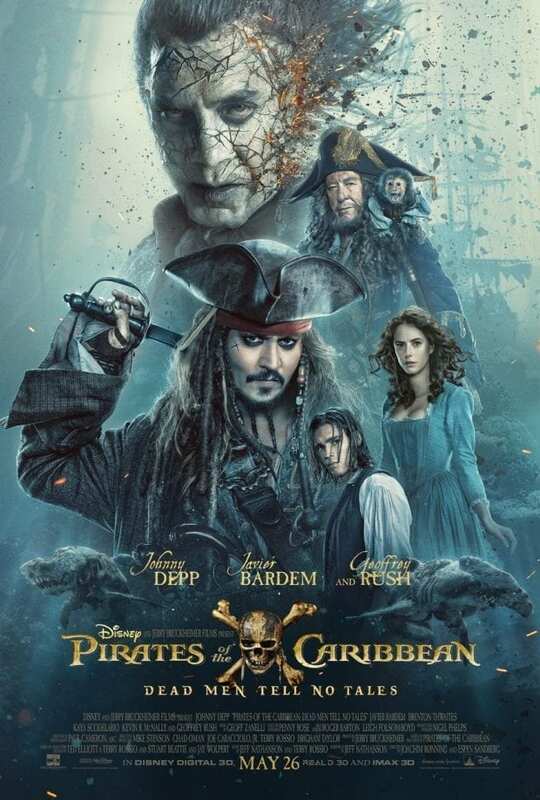 With changes to the script that mainly centered around Javier Bardem's character, Captain Salazar, as well as Jack Sparrow's origin story. Joachim Rønning: That, I remember we had like 10-15 versions of that [Jack Sparrow's back story]. That was a long and grueling process because of the mythology of Pirates of the Caribbean, the series and movies, it’s a complex mythology so and you don’t want to step on anybody’s [toes]–. You know there’s a lot of fans out there that know everything [about the film and ride]. And so it was important for us to be ahead of that and not mess with any of the previous back stories. Espen Sandberg: We also wanted to blend that back story of Jack with Salazar’s. So that their relationship and the revenge story became personal, so to speak. Pictured: Young Captain Jack Sparrow (Anthony De La Torre merged with Johnny Depp) © Disney Enterprises, Inc. All Rights Reserved. Me: When you were filming the young Jack scenes, was the process similar to Rogue One and filming Leah, the young Leah in terms of the CGI for his face, for Anthony’s face? JR: I would say yes and no because the Leah was not with Carrie Fisher but we shot with Johnny Depp. So I mean the youthification that we call it –. I’ve been misquoted in so many newspapers saying, beautification but it’s youthification. And, very important. And we shot it with Johnny and then spent the year in the computer basically. There’s a company in Santa Monica that does it called Lola. Fitting, fitting name. ES: Now Johnny can do 21 Jump Street again. JR: Yeah, exactly. He was thrilled when he saw the result. He was a little like freaked out by it like looking at it but he loved it. And that was a fun moment. A little background on Lola, they don't just “youthify”, they also can age characters as well. They have done this for many of Disney's films including Guardians of the Galaxy Vol. 2 (Young Ego), Captain America: The First Avenger (Steve Rogers before he was strong), Captain America: Civil War (Young Tony Stark), Captain America: The Winter Soldier (Old Agent Carter), and the list goes on and on. They do amazing special effect work. 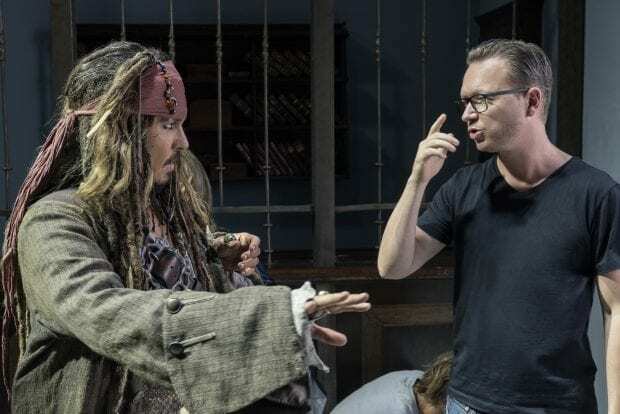 L to R: Johnny Depp (Captain Jack Sparrow) and Director Espen Sandberg..©Disney Enterprises, Inc. All Rights Reserved. Q: What was it like working with Johnny Depp? And what was the chemistry like on set? Espen Sandberg: Oh, it’s amazing. He’s so funny. And I mean, what you see with Jack Sparrow is, it’s all Johnny. And he’s a genius. I mean for us he’s like up there with Chaplin and the other ones because his timing is just perfect and he has such a weird imagination. So he comes up with the craziest ideas. And for us, the highlight was always going into his trailer in the morning and going through the scenes and the lines and trying to come up with even more cool stuff to do to make it even more funny. And of course, when we started shooting he would do something completely different. And everyone was sort of thrown off but that also makes it come alive and funny, so. 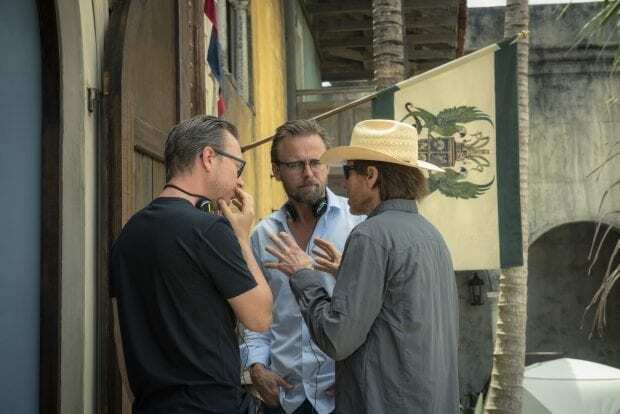 L to R: Director Espen Sandberg, Director Joachim Rønning and Producer Jerry Bruckheimer..©Disney Enterprises, Inc. All Rights Reserved. Q: Pirates is such an iconic part of Disney and history. What’s it like being part of that? Is this what you’ve wanted to have that kind of feather in your cap? JR: For sure. No, it’s a dream come true. I think you know we grew up with Disney movies and –. ES: And it’s so much bigger than us. It’s amazing to go to China and there are thousands of screaming fans. You know, it’s such a global phenomenon and it’s because they love the universe. They love the characters. And for us to be a part of that and keep that story going is really cool. Go see Pirates of the Caribbean: Dead Men Tell No Tales, in theaters now! I love the insight about the script process and the timing of jokes. That makes it so much more interesting.